At Sleepbox we are passionate about supporting charities and worthy causes both here in the UK and across the globe. We believe with our support we can make a real difference and help others build a more positive future. is to be used by the relatives of sick babies and children currently being treated in the Hospital. 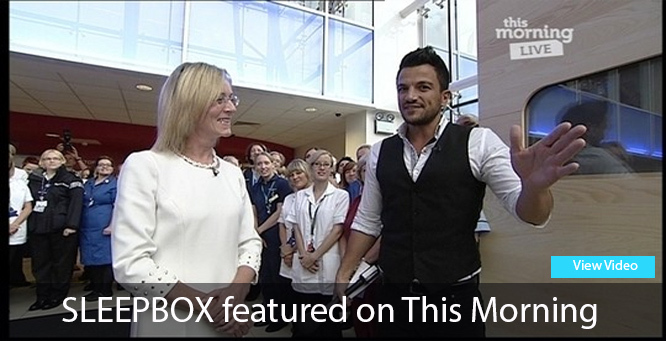 The Sleepbox presentation was made by Peter Andre. Click HERE to view the video. Sleepbox are delighted to support The Sick Children’s Trust and the Rainbow Trust Children’s Charity. To be considered by Sleepbox for donations please email all charity and fundraising requests through to charities@sleepbox.co.uk. Due to high demand we regretfully cannot guarantee success.